Say Hellooo to KiddosArt's own Celebrity Munch-Bunch Happy Animals! 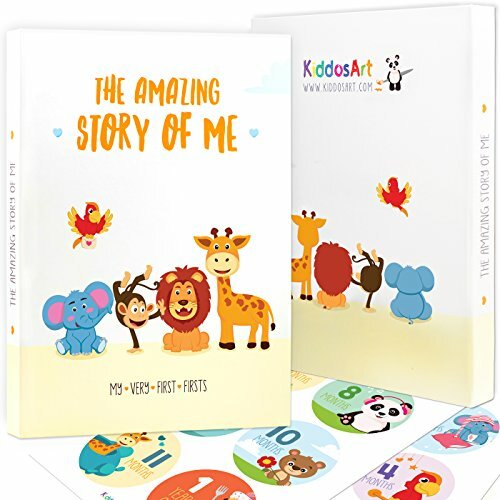 The Amazing Story of Me starring our Happy Animals crafts beloved moments into memories for a lifetime. Join the Munch-Bunch friends on a colorful and joyous adventure of laughter and hops. and sweetness to your favorite memories in a beautifully drawn baby memory book. bundled with a keepsake envelope and 12 monthly stickers. ✔ Birthdays - up to 5 years old! to record your baby's growth, as a precious keepsake to reminisce on for many years to come. ❤ The perfect modern baby shower gift for Expecting Parents. ❤ The most complete Baby Book/Photo Album/Scrapbook available anywhere! ❤ Unisex Design: Perfect for Boys or Girls! ❤ Records baby's 1st year's growth in great detail + 5 birthdays and Holidays. ❤ 72 beautifully drawn 8.5" x 11" pages with original storytelling artwork. ❤ FREE! 12 monthly stickers & 1 keepsake envelope - just because we LOVE! ❤ Responsibly Printed, Eco-friendly, Soy based-Inks. Parents, we're here for you! Feel free to contact us with any question! WE DO ART! : At KiddosArt family we put our hearts and souls to craft the most beautiful baby memory books you will ever find! Each book contains 72 responsibly printed pages of a colorful and joyous story, filled with laughter and joyful characters such as Elephant, Panda, Giraffe, Lion, Monkey and MANY MORE! adding a touch of sweetness to your favorite memories. MEMORIES FOR A LIFETIME: The Amazing Story of Me is the most complete baby memory book available anywhere! With 72 pages filled with your most treasured memories, from the day mommy and daddy met to your child's first year in school, our memory books have room for over 100+ photos to capture your baby's first year of milestones, holidays, first 5 birthdays and many more happy events. EASY TO USE: We created THE AMAZING STORY OF ME as an easy and fun-filled way for you to mark your baby's early years of growth and development. The size for every picture is written on the photo frame in each page on our book, simply cut & paste your pictures and start making your own unique memory book for you and your family to rejoice for many years to com. 100% SATISFACTION GUARANTEED: We LOVE our customers and we'll personally do everything to guarantee you a pleasant shopping experience. If for any reason you're unhappy with our products, we offer a full refund - no questions asked! If you have any questions about this product by KiddosArt, contact us by completing and submitting the form below. If you are looking for a specif part number, please include it with your message.